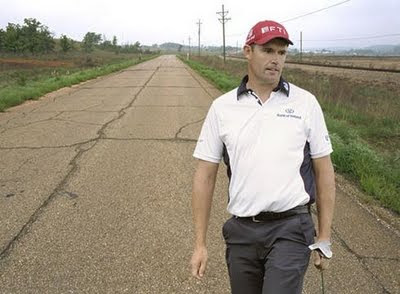 I missed it, but a reader advised me that my near-neighbour (well, about 3 miles away), Padraig Harrington, was involved in a Rules incident at the recent Deutsche Bank Championship in Boston, the detail of which is an interesting continuation of my blog last week on deeming a ball unplayable. Padraig pulled a tee shot into the trees and, because he was not sure that he would find it, he correctly played a provisional ball from the teeing ground, so as to save time if his original ball was lost. In fact, he soon found his original ball but deemed that it was unplayable. Apparently, two club lengths would not give sufficient relief, nor would dropping a ball back on an extension of the line from the hole and where the ball lay in the trees, so he chose the option of replaying a ball from where he had previously played, under penalty of stroke and distance, taking the ‘long, lonely walk’ back to the teeing ground. Many golfers would question why, in these circumstances, Padraig didn’t play his provisional ball, which was lying in good shape in the middle of the fairway. The answer is that Rule 27-2c prescribes that if the original ball is neither lost nor out of bounds, the player must abandon the provisional ball and continue playing his original ball. Indeed, having found his ball, if he makes any further strokes at the provisional ball, he is playing a wrong ball and the provisions of Rule 15-3 apply. Once he deemed his ball unplayable and decided that Rule 28 options b) and c) would not give him sufficient relief, he had to take the only other option, 28-a), and return to where he had last played from, under penalty of stroke and distance, playing his third stroke off the tee. The logic of this ruling is similar to that explained in my previous blog, immediately below this one. The Rules don’t give a player the opportunity to choose between alternative places to play his next stroke from unless he is taking relief under penalty. Of course, if a player is happy with his provisional ball, even though it lies two strokes more than for his original ball, he may choose not to look for the original and continue play with the provisional. However, if his original ball is found by someone else, for example by an opponent, prior to him making his next stroke at his provisional ball, he must play the original ball, or deem it unplayable under penalty of one stroke. This is a rule that has confused me a couple of times - especially in these days where pace of play is a big issue. Mickelson found himself in this situation a few years back at The International in a playoff. Tee shot into a ravine, he hit a provisional, looked for the first ball and tried to declare it lost to move to his provisional when someone found it. Of course, Mickelson complained that he had already declared the ball lost, but the referee said that the ball was found before the search was abandoned. It just seems to make more sense that, if a provisional has already been hit, that you should just move to that ball instead of taking all that additional time to return to the previous spot to hit yet another ball. Then again - the REALLY cool part of this story is that you live just a few short miles from Paddy ! A truly great guy - can't wait to see him here in Atlanta this week. You cannot declare a ball lost. This is a very common misunderstanding but I am sure that Mickelson was aware of it. Check the Definition of 'Lost Ball' at the front of the Rules book to see when a ball is deemed to be lost. I am sure that what the Referee ruled in this incident was that the original ball was found within 5 minutes of the search starting and that the provisional ball had not yet been played from a position nearer the hole. I don't know, Barry. Rule 27-1 says..."At any time". That sounds like the player can declare his ball lost and return back to where he played his last shot. OR - does it mean that he has to actually return to the previous spot and strike the ball before the search is officially off ? At any time, a player may, under penalty of one stroke, play a ball as nearly as possible at the spot from which the original ball was last played (see Rule 20-5), i.e., proceed under penalty of stroke and distance. Except as otherwise provided in the Rules, if a player makes a stroke at a ball from the spot at which the original ball was last played, he is deemed to have proceeded under penalty of stroke and distance. Please believe me that a ball cannot be ‘declared lost’ by a player. Let me give you an illustration of why not. A player plays a ball off the tee into deep rough. He then plays a provisional ball down the middle of the fairway. He says to his fellow competitors that he declares the original ball lost and will continue to play his provisional ball. However, before he has time to play another stroke at his provisional ball a ‘helpful’ spectator says that he has found the player’s original ball. The player must then either play the original ball or deem it unplayable. He may not proceed with the provisional ball. Of course, if a player does not want to continue play with their original ball they may put another ball into play under penalty of stroke and distance (Rule 28, Ball Unplayable). But it is the action of putting another ball into play to replace the original ball that renders the original ball lost and not anything that the player may say. This should become clearer if you read the definition of 'Lost Ball' at the front of the Rules book. That's what I was asking - and I understand you can't just say "that ball is lost" (even though that's what we usually do because the course is backed up and we can't spend time getting to where the ball went in...then spend 5 minutes looking...then take more time going back to the previous spot...then back to the group...backing the course up even further). Do you HAVE to go to the spot - then return to hit another ball in order to end the search before the 5 minutes is up ? In a tournament, I completely understand what you mean, though. Yes, if a player's ball is lost or out of bounds, and he has not played a provisional ball, he MUST play a ball, under penalty of one stroke, as nearly as possible at the spot from which the original ball was last played. I do not accept your point about backing-up the course if a ball is lost. There are three tips here; a) always play a provisional ball if you think that your ball may be lost or out of bounds, b) always ask the following group to play through if you have to walk back to where you played your last stroke from and they are ready to play, and c) make an effort to catch-up on the group in front by walking quicker between shots and holes.